What do the Texas Rangers have in common with the Buffalo Bills? A lot, actually. Can the Rangers make it a third trip to the World Series? Pretty good chance, but the question remains – can they actually win it? 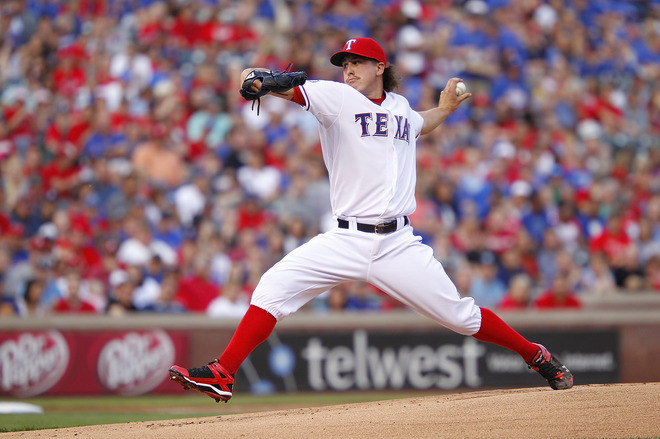 McGILLIGAN: Watching the Texas Rangers dismantle the Toronto Blue Jays young pitching staff this past weekend was fun. The Rangers are loaded with talent on all sides of the ball and yet I have zero confidence they can win the World Series. Can they get to a third-straight World Series? Absolutely. Will they find a way to lose? Yes. The Rangers are the Buffalo Bills of Major League Baseball. A team loaded with iconic talent that romps through the regular season, does well in the playoffs, but comes up short when it counts most. Player wise the similarities are there. You’ve got a once in a generational talent like Josh Hamilton posting ridiculous numbers. He’s the Rangers Bruce Smith who was dominant in the early 90s and posted a season with 101 tackles, four forced fumbles and 19 sacks in 1990. Hamilton is surrounded by all-stars in the form of Ian Kinsler, Michael Young, Yu Darvish, Adrian Beltre, Mike Napoli, Elvis Andrus and Joe Nathan. The Bills had a supporting cast of Jim Kelly, Thurman Thomas, Darryl Talley, Cornelius Bennet and Andre Reed. Talent wise, it’s hard to argue either team has or had an equal. However, despite the solid numbers, a narrow defeat (1990 Super Bowl for Bills and 2011 World Series for Rangers) left a black cloud over both squads. The Bills went on to become sort of a punch line in that no other team has lost three-straight Super Bowls and the Rangers don’t want that distinction. This season, the path looks even clearer for the Ranges to be the American League champs again, but I bet most money would go against them in the World Series. Right now they look like world beaters, no one can come close to them. But just think back a few months, the Cardinals had no business in that World Series yet they have the rings Texas covets. LIVINGSTONE: I can’t argue against what McGilligan said above – the Rangers remind me a lot of the Buffalo Bills, loaded with talent but when it comes down to the clutch, that one moment in a game where a guy needs to step up and be the hero when it most counts, they falter. Not only does the lack of clutch been non-existent the last two World Series the Rangers have played – I’d say the clutch is there this year with the likes of Josh Hamilton looking like he’s from another planet, he could be the player they’ve been waiting for to step up to the plate, so to speak – but so has the pitching. The Rangers aren’t known for their sold starting pitching. They lead the league in nearly every major hitting category – Homeruns (75), average (.278), runs (280), RBI (273), slugging (.477) and OPS (.823) – but winning doesn’t just come down to offense. In close games the Rangers have scored 17 runs in late innings, putting them 23rd in the league with a .252 average (NOTE: all stats courtesy of MLB.com), and are a mere 5-7 in one-run games with four blown saves on the season. Look, the Rangers are good, but the pitching, after losing CJ. Wilson to free agency, is the team’s biggest question mark. With a 3.40+ ERA good for 11th in the league and opposing hitters hitting .250 (10th) and a 1.29 WHIP (14th), the starters are merely average. The relievers are tops in the league, posting a 2.16 ERA and an opposing average of .194. Great, but we saw a dominate bullpen in Atlanta last season falter come the end of the season due to being overworked. I guess only time will tell, but I wonder if Texas will be able to ride offense all the way to the World Series championship.